Christopher Lee stars in this horrific crime drama about a most barbaric and torturous Chinese criminal, Fu Manchu, who uses different and exotic methods of killing people, sometimes forcing others to watch. Nayland Smith (played by Nigel Green), of Scotland yard, witnessed the execution of this most prolific and heinous criminal, yet a sudden rash of murders in London seem to emanate his style. I couldn't help but notice how Nayland Smith and his sidekick, Dr. Petrie (Howard Marion Crawford), reminded me so much of Sherlock Holmes and Dr. Watson. Their character resemblances are stunning right down to the most minute detail. They even look like Holmes and Watson. 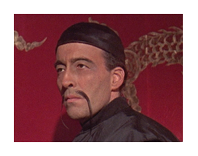 If one didn't know they were watching The Face of Fu Manchu, they might think they were watching an episode of Sherlock Holmes. The story is put together in such a dark and eerie fashion - it bothered me to watch it. One of the more traumatic scenes was slightly graphic, but nothing like today's graphic horror scenes, at least. The very idea, though, that someone could even think of such horrendous things to put into a story is troubling to me - Fu Manchu's character is dark and disturbed in a way like no other - to call it evil would be an understatement. I find that it is equally disturbing to see such things put into motion pictures. I suppose this subject matter and content has a certain appeal to people who enjoy being scared out of their wits, but I'm not one of those. The mysteriousness of this story was appealing to me, however, and I did enjoy that aspect of the movie. Being a Sherlock Holmes fan I took particular delight in watching Smith and Petrie attempting to solve the mystery of whether Fu Manchu was executed, and if not, who it really was. I think those two were the best part of the whole movie, and their characters lent charmingly redeeming qualities for an otherwise evil movie. As if the movie wasn't evil enough, though, enter Fu Manchu's evil daughter, Lin Tang. This character is nothing less than the bride of Satan - so terribly repulsive. That arrogant, wicked look on her face, the way she carried herself - even her hair style was annoying. Yes, she was pretty on the outside, but uglier than sin on the inside. How can such an abominable woman look so beautiful? This movie's one annoyance was non -Asians playing the lead Chinese roles. What's up with that? Weren't the Chinese actors good enough? I've noticed this in other productions with lead Asian roles too, while the supporting roles would usually be played by Asians. It just looks and sounds so out of place to me - but is nothing new. We see this kind of casting in many productions - The King and I, Charlie Chan, The Magnificent Seven, and even Breakfast at Tiffany's, just to name a few. For me, watching non-Asians with their peachy skin and nauseatingly fake accents reduces the quality of Asian character roles, thus reducing the overall quality of the movie, sadly. Other than this issue, though, the storyline can be rather engaging. But don't take my word for it - you can purchase the movie and watch it for yourself via wbshop.com and enjoy the heck out of it. It's probably a good idea to watch this with someone you feel safe with; and folks - don't show it to the kids. Yikes!